Pest management professionals who attended the 2016 Legislative Day event received a warm welcome. The upcoming presidential election made this year’s event especially important — and entertaining. Another National Pest Management Association (NPMA) Legislative Day, held at the Capital Hilton in Washington D.C., has come and gone, and this being an election year, made it one for the books. After the committee and council meetings that occurred throughout Sunday, March 13, on Monday, March 14, the event kicked into high gear with a full roster of informative breakout sessions. Billy Stump of the Central Intelligence Agency spoke on the ins and outs of how a business can best part ways with an employee. The presentation, “Separation: The Final Leg of the Employee Life Cycle,” provided managers and business owners in attendance with a crash course on “termination basics,” administration of taking disciplinary action, in addition to touching on a few legal considerations that should be taken into account. After a short break, a panel discussion on structural fumigation legislation — featuring Jim Aidala, Bergeson & Campbell P.C., Liza Fleeson, Association of Structural Pest Control Regulatory Officials (ASPCRO), and Jack Housenger, U.S. Environmental Protection Agency (EPA) — put forth their observations about the state of structural fumigation as well as their insight into what the future holds. Concurrently, Professional Women in Pest Management (PWIPM) hosted Erin Andrew, an assistant administrator from the U.S. Small Business Administration for an hour long presentation and Q&A with female pest management business owners as well as women looking to build their own pest management companies. 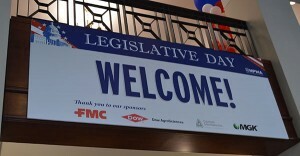 Monday’s Legislative Day main events packed the presidential ballroom. First was the luncheon and keynote presentation/debate between Ari Fleischer, former White House press secretary, and Paul Begala, CNN political commentator and former Bill Clinton staffer. The sit-down debate was moderated by NPMA’s outgoing president, Bob Rosenberg and mostly focused on the upcoming U.S. presidential election. The debate was lively, amicable, and at times quite funny. (Begala does an amazing impersonation of President Clinton.) As one might expect for this election cycle, Donald Trump was a central topic of discussion. This wouldn’t be the last presentation to make the election its centerpiece. After the NPMA’s Andrew Bray and Jim Fredericks provided a briefing on this year’s primary legislative issues [see upcoming post for details on these issues], attendees broke into state caucuses to formulate their lobbying strategy for their upcoming Tuesday meeting with each respective state’s Congressional delegation. The late afternoon offered a keynote presentation by Nicolle Wallace, a political analyst, ex-cohost of TV’s “The View,” current NBC personality and former White House Director of Communications. Wallace gave an interactive speech and spent more than half of her time on stage fielding questions from attendees about the upcoming election and the future of the GOP as it relates to both the country and, more specifically, the pest management industry. Monday was capped with a special reception for attendees, which gave attendees time to process what they’d learned, network with one another, while enjoying NPMA-provided food and drinks. Tuesday was the third and final day of the event, and also the most important, as it was time for all in attendance to make the trip up Capitol Hill to meet with their members of Congress. However, before heading out a breakfast keynote address by political commentator SE Cupp energized attendees with her presentation: “The State of Play: Politics, Media and 2016.” Naturally, the U.S. presidential election was a central topic. Former NPMA CEO Bob Rosenberg moderated a debate between Paul Begala and Ari Fleischer.